During the late 19th century, our Lower San Pedro River area was settled later than the Upper San Pedro, partly because the latter had more mining potential and partly because grazing resources were less impressive. While Anglo "Mountain Men" had extirpated the beaver population during the 1830s, the first permanent village in this area was established by Henry and Lem Redington in 1875, which they called Redington. As time permits, we will provide a series of accounts of these and somewhat later times in the essays listed below. Rod recalled his aunt talking about walking from their homestead to the Cascabel School, which was located along the Cascabel Road on the property that Christine Curtis now owns. Daniel helped direct them to the homestead ruins, and emailed photos of it to them. Rod’s grandfather's name was Francis Bennett, whose brothers were named Buck and Wiley. Francis had mines up off Paige Canyon. Rod's uncle is Alvin Owens, who homesteaded the property where Daniel, David and Pearl now live. On Monday, October 20, 2003, David, Pearl and Daniel went to meet and picnic with Rod and Mary at Rod’s uncle Alvin Owens' home in St. David, 237 S. Miller Lane. Alvin Owens' father was Henry Alexander Owens. Henry had a homestead up Paige Canyon in Happy Valley, and a herd of several hundred Angora goats. Alvin was born October 16, 1908. He had about an eighth grade education as his family couldn't afford for him to go to high school. When he was 16 his father went out of the goat business and had to get a job. He went to work in Superior, but Alvin stayed on at their homestead for about a year. Around 1929 Alvin moved to Hot Springs Canyon and homesteaded 640 acres around where the windmill now stands, presumably section 12. This was apparently in order to be close to the Bennetts, whose daughter Jewel (or Jewell?) he courted and soon married. Francis Marion Bennett was born in 1889 in Kerrville, Texas and moved with his wife Lillie Shirley to Arizona in 1926. They came to Hot Springs Canyon from Bonita, Arizona and homesteaded here. Francis' brother, Buck Bennett, had a homestead further up Hot Springs where it "boxes in", and lived in an army tent. Buck's son was Bill Bennett who was later handicapped and a good fiddler. A man named Jim Wilson also homesteaded up near the Yellow Cliffs in Hot Springs Canyon. Francis Bennett was a truck farmer, growing beans, corn, pumpkins and such on about an acre. He had an irrigation ditch from the wash for a while, but floods ruined it. It was mostly difficult dry farming. The Bennetts had ten children. Rod Harp's mother Marjorie was the second youngest. Alvin said the kids had a swimming hole in the side canyon just below the Red Trail, the same trail of that name today. He said they didn't walk all the way to school, that they had some kind of transportation. 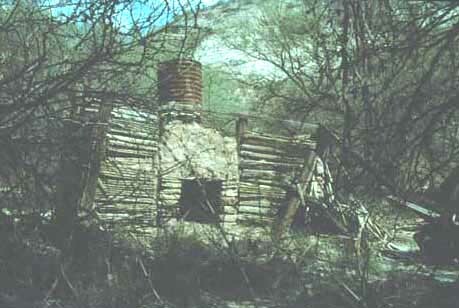 In an old photo of the "1930 homestead", Mr. and Mrs. Bennett are standing in front of the ruin that was then more recognizable as a house, with neat saguaro ribs nailed to a milled wood frame. In 1936 Francis Bennett moved his family to Oregon because there was 'nothing to do' for his family here. Alvin said the Depression was “terrible bad” in this area, but was improving around 1936. The Bennetts later moved back in 1941 to truck farm again somewhere near Pomerene. Francis and Lillie died within months of one another in 1959. Alvin told the story of asking Francis Bennett for his eldest daughter's hand in marriage. He had written to Mr. Bennett earlier regarding the issue, but had received no reply. He then went, hat in hand, to the Bennett place. Apparently Francis kind of avoided Alvin while planting his bean field, as the whole family looked on. He said that he fell in love with Jewel, and that was 'like getting hydrophobia' which you can't shake. They were married on August 26, 1930. He was married to her for 71 years until her death three years ago. Alvin also had a serious accident, one of many during his life, in which he was dragged by a horse right near the present ruin. Alvin lived in a tent at his homestead in the canyon for less than a year. He hand dug a well to some 30 or 35 feet, and shored it up with mesquite branches because it was very sandy. The windmill, erected in 1946, now stands on that same spot. Homesteaders had five years to 'prove up' or improve a place before taking possession. Not long after his marriage Alvin was offered five mother cows by L. V. Lane, the cattle inspector, to 'relinquish' or take his name off the land. He willingly agreed to the deal since he wanted to move and start cattle ranching anyway. He doesn't know how long L. V. Lane had the place. Lane may have built the homestead cement pad near the Windmill on which Daniel now lives, but that point was unclear. Alvin then moved to Teran Wash with his new wife at a fork where there was a spring. His father now had a homestead further up Teran Wash, and had gotten into cattle. Together he and his father had two sections and ran cattle in the open country around Sierra Blanca and the Muleshoe. They had 150 head, but it sounded like only 13 of them belonged to him. Alvin only lived there a couple of years. He said there was a herd of some 300 wild horses in that area at the time. Alvin and his brother trained horses for the Muleshoe and the Barley (present A7) ranches. He said that he worked for Homer Sheffield, cattle boss for Mrs. McMurry who was then owner of the Muleshoe. He also worked for Hope Jones of the C-Spear among many others. He built the road down into Redfield canyon where the historic old rock house is. Alvin was a 'professional trapper', and that helped bring him out of the Depression. At one point he was getting $200 - $300 for a bobcat pelt. He trapped 3 or 4 lions on the San Pedro (maybe 50 in all), and also one bear which was killing cattle. He trapped two or three Lobo wolves, one on the Muleshoe in the early '30's. In one six week period he trapped 54 bobcats and about 120 coyotes. He ran a trap line from St. David to Tanque Verde. He said Cascabel wasn't all that different from what it is now, except for the buildings. He helped build the old schoolhouse and went to dances there. He is a fiddler, guitar and harmonica player. He never spent much time up in the Redington area. Alvin was in surprisingly good shape, both mentally and physically, especially considering his 95 years and many harrowing accidents. After a while we went into his house to watch a video and listen to a tape of some of his music playing. It was a very pleasant afternoon.